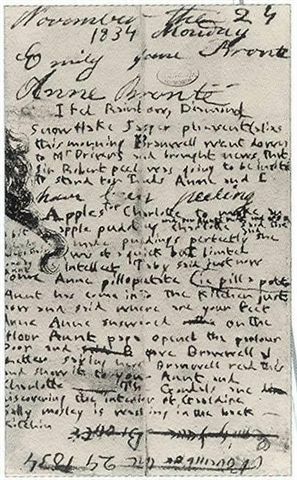 The McScribble Salon: Emily Brontë’s Diary Papers: Genius or Just Genial? 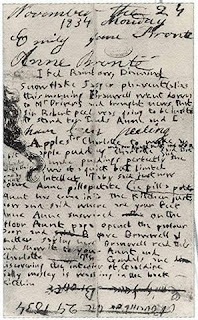 Emily Brontë’s Diary Papers: Genius or Just Genial? In most biographies of writers, you find the author reporting on the subject’s dozens, if not hundreds of letters left behind, as well as early drafts of their work, or discarded manuscripts that never got published. These works might have been kept by relatives or in museums, or stashed away in desk drawers. Charlotte's output of letters consists of 3 volumes. Writers must write. It's in their DNA. Emily and Anne wrote a couple of letters and a few pages of diary/birthday papers. Emily and Anne weren't writers, but Charlotte made them into authors when she announced to the world that Currer Bell, Ellis Bell, and Acton Bell were three brothers. Later when the possibility of legal action necessitated her having to admit they were actually three sisters, she kept their male pen-names on the novels, and died before revealing their real names to her reading public. Why she did this is outlined and explained in detail in Charlotte Brontë’s Thunder. Trapenard begins: “Of Emily Brontë’s experience as a writer, the least we can say is that we do not know much.” He adds that reading the diary papers, “is enough to shatter the icon of Emily as a Romantic genius or Victorian martyr.” He says this because critics agree that the writing is bad and, as Juliet Barker points out, “the dreadful handwriting and spelling are scarcely credible as the work of a highly intelligent sixteen-year-old.” If we were shown these papers without knowing who wrote them, we might bring a more objective eye to the childish musings, and view the writing as mediocre, but if we’re told Emily is a genius, we search through her words for a multi-layered profundity that simply isn't there. I personally don’t believe these diary papers contain sufficient complexity to warrant a close analysis, but if a critic like Trapenard wants to try, we should respect his efforts but be permitted to disagree.